Is It Snobby To Bring Your Own Wine On Planes? Not many people realize this, but you actually can bring your own booze on airplanes. Provided you stick to 100ml bottles, you can even bring it from home. One thing you can’t do: serve it to yourself on board. Cabin crews are responsible for your safety and like any good bartender they need to have a rough estimate of how you’re doing, but under the right circumstances, they’ll gladly pour from your private supply. Duty free and airport restaurants offer some of the finest wines and spirits in the business, and as airlines slash away at costs, a subset of travelers are opting to say no to the mystery sparkling wine, and yes to another glass of their personal Dom Perignon stash. That leaves one question: is it snobby, or is it brilliant? Passing through any major gateway airport for an international trip, travelers are bound to pass by one of the many duty free liquor selections. In fact, airports are specifically designed to force you past these discount booze and perfume purveyors. If someone is all too familiar with airline wine or spirit selections and feels like living a little bit, one could grab an appealing bottle and bring it on board. That’s especially true when in economy and faced with no free options. Once on board, the crew would need to agree to serve it to you, but many oblige without question. It’s very hard to imagine a crew functioning in a galley full of personalized ice buckets with seat numbers and name tags written on, and this could easily get out of hand, but few people are bold enough to actually ask, and in reality this sort of thing has been possible for years. Even on domestic or short haul trips, a good airport restaurant is almost always willing to sell a bottle and turn the other way as it sails away into your bag, after being paid for of course! Some cabin crews may refuse to pour an already opened bottle, so if this is your play, be sure to insist on “opening the bottle yourself”. Some cabin crews may refuse to serve entirely, because their job is primarily “safety”, but that’s another story for another day. There are so-so-so many fair questions here, but for true wine and spirits enthusiasts, it’s almost a commendable idea. 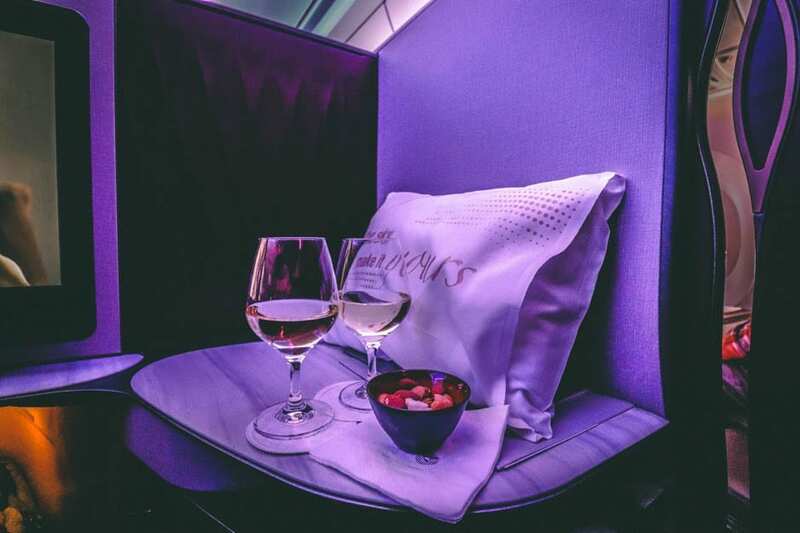 Most airline wines, even on long international business class routes, average a retail cost of roughly $12 per bottle, and that’s assuming you’re in a cabin that privileged. In short haul economy, most airlines don’t offer any “free” booze at all, and on long haul premium or economy, many of the wines do a wonderful double act as advanced paint thinner in their free time. This brings the big question..
Is it crazy to spend $25-$200 on your own world class red, white or champagne, free alternative or not? Is it snobby to bring your own wine on planes? Whine sold separately. Logic might not be the right word, but there are plenty of celebratory or social cases where this could easily be seen as an amusing way to spend time. If I’m stuck on a flight for 12 hours with a colleague, I can see the amusement and intrigue of discovering a truly great wine. But this still doesn’t answer the question: is it snobby? Wherever you sit, whichever cabin you find yourself in, you’re sending a message that you don’t feel that what’s being served to the group is acceptable to you. If nothing is being served at all, you’re still drawing attention to yourself, like it or not. In reality, you really may not be alone with the “this isn’t good enough”, but like speaking up in general, few actually have the nerve to make those statements “out loud”. By doing this, you are. Finesse is also a key here. It may be harder to adequately communicate to a cabin crew that you don’t mind your Dom Perignon being poured into the thin plastic cup in economy, and if standard procedure is one round of drinks before lights are turned off and cabin crew do their best ghost impressions, getting your bottles worth may take a bit of legwork – literally – but those are the finer details, and these are questions for the dreamers. One could say Delta somewhat started this line of thinking. After countless complaints about the mystery wines and spirits being poured from behind the well, Delta began offering a “premium” beverage selection for pay, using miles or cash in its Sky Club lounges. Sky Clubs are likely the only place on earth where 10,000 Skymiles can uncork a bottle of Dom Perignon, or 12,500 for Krug. Is it obscene? That’s up to you. Previous ArticleHow Much Time Do You Need For An Australia Trip? Oh please. If a flyer is snobby enough to want a specific wine, they are wealthy enough to fly an airline that will remember their wine preference. If you want to hear “Mr. Points we have your bottle of Pouilly-Fuissé waiting for you” then buy your plane tix accordingly. It’s a lot easier than BYOB. Snobby and flying commercial? Hardly.